There's still a problem with installing the game. Just wanted to inform you. By the way do you know more detailed realese date yet? Dunno if you guys have heard about this from someone else, but seems like there's a problem with installing the game from the desktop client. Downloaded and played this demo ages ago. Had an issue with it ending after ch.1, but that was solved by downloading directly from uof7.com. Now, tried to reinstall it (new computer) but get an error, and can't install it. Checked out the file that gets downloaded, and it's weird - not an exe, zip, rar, etc. file, actually doesn't seem to have any file type -- def not the same type as most other itch.io games. The client's updated since then, so I guess something was changed in an update? Downloading from itch.io in browser gets me an actual rar or zip file., so the problem's just with the client. Hi wallach! Thanks a lot for letting us know and describing the issue in detail : ) We've had this problem before (we believe it was you who told us about it, actually!) and thought we dealt with it, but you're probably right and our solution didn't withstand the test of client update. We know what to do to fix it more, er, permanently, though, so thanks again for bringing it to our attention! No problem. Yeah, I think it was me before, and like I said the the client update brought up the issue again, so you guys know what you're doing! Can't wait till this is a full game! Hey there, I took a look at the issue and it seems v23 of the app isn't able to extract the .rar (for the Windows build) as it is currently. Hi Amos! Sorry for the late reply... As you can see, we've decided to take the "wait long enough approach" :D But seriously, thanks for the advice. We'll be updating builds soon with a new demo and EA release, and we'll make sure to use butler for both! I put this off and, once I started playing it I was sorry I did! It's a really brilliant game! An Awesome demo that leaves you wanting more! I seriously adore Ollie in all her snide little ways! Hi Raithias! Well, better late than never, ha-ha :D Thank you for letsplaying! We're glad that you loved Ollie (we do, too! ); hope you'll be back for next release! I'll be back if there is more Oliie! i keed i keed! (or do I?) No really you guys have a great game can't wait for the next release of this. Keep up the great work! Enjoyed the demo! You laid some pretty fancy lore down, and created an interesting world. I just wish the demo had ended with a little taste as to what the plot was! I'll be watching the development of this to see where it goes! Can you tell me the title sequence music please ? That song practically made me want to play this wonderful game. Hello there i love this game and i was wondering if you could tell me about the music in chapter 2 that starts playing when you enter mayas room. I really like it and would like to hear it more. Hi dembaku72! Thank you : ) The music is "Waiting on a Dream" by Rusty Bradshaw. It's a great chill-out track, we're glad you liked it! Played the demo. Looks good. Could you extend it to include one of the boss battles? I wanna see how they work. Hi HelBeard! Thanks for checking Minotaur out. Unfortunately, first boss battle happens much later in the game, so we'd have to extend the demo considerably (isolating it would require a lot of work, too). However, we'll start testing alpha in a couple of months, and will record a bunch of videos from the game. Those will certainly include boss battles! Hope you'll check us out then. Cheers! Whenever I download it anywhere, it tells me I'm missing MSVCR110.dll. Any solutions? Hi batmanisfab! This is a file from Microsoft Visual C++ Redistributable package. The package usually comes with game clients (such as Steam) and other software, but it's not included in this demo. If you want to play the demo and you don't have this package, you will need to do download and install it. Here's the link which covers most Windows versions. Not at all:-) We hope you'll be able to run the game! Hello! This game looks amazing and i'm dying to try out the demo, sadly i cant seem to intall it. this is most likely a problem on my part i just wanted to make sure. Hi Zeeloo! Thank you for checking us out. Can you tell us which system you run (Windows or Mac + version), and whether you're trying to launch the game directly or by using itch.io client? Hi! thank you so much for getting back to me. I use a windows 10. And i try to download it from the itchio desktop client. Thanks again! That should do the trick! But let us know if it doesn't. Thank you! It's a wonderful demo and i cant wait for the full game! Thank you, Zeeloo! We're glad that you were able to launch it. And even more so that you liked it :D We hope you'll play the full game once it's out! Hi wallach! You're right, there are supposed to be two chapters: Nod's and Maya's. Can you tell us where, exactly, does game end for you and how does it happen (do you return to menu or does game just quit)? Hi wallach! I'm sorry we missed your comment... We're glad that you managed to play full demo, but we'll make sure to look into problem with itch.io version, so thanks for reporting it! This game is great! I've only played Chapter 1 so far, but I'm just really liking the aesthetic, the characters, the voice acting, the dialogue, it's all top notch! I can't wait to see and play more! If you're interested in seeing some of that gameplay, here's a link to check it out! Hello, I apologize for bothering you with such a basic question but...how can I extract the RAR file? Hey ohbde, you probably figured it out already — you need a software like WinRAR to do it. Hi, FireCatcher8585! Thank you for your comment... and especially for going an extra mile and voting for us on Steam:-)) A "dystopian wonderland" sounds like a great tagline, and we're happy that you liked the game. We wish you best of luck with your projects, too — let us know when you'll post a game on Steam! This is a really cool and well crafted visual novel. The art style is great and well detailed, the music fits perfectly with the world, and the story is interesting and open for expansion. I realize this is a short demo for a much larger story, but I am really impressed with whats here. I play a lot of VN and I have to say there are very few that look like this game. I love the fact that the world still feels very much alive when playing through the dialogue. The fact that there are actual animations and moving parts around you, really makes this world stand out instead of a still image. All in all a great and interesting indie VN that I look forward to playing more once the full version is released. I did a video on my experience with the demo if anyone is interested. Hi, Maineiacs! Thank you for your detailed comment and a great let's play. 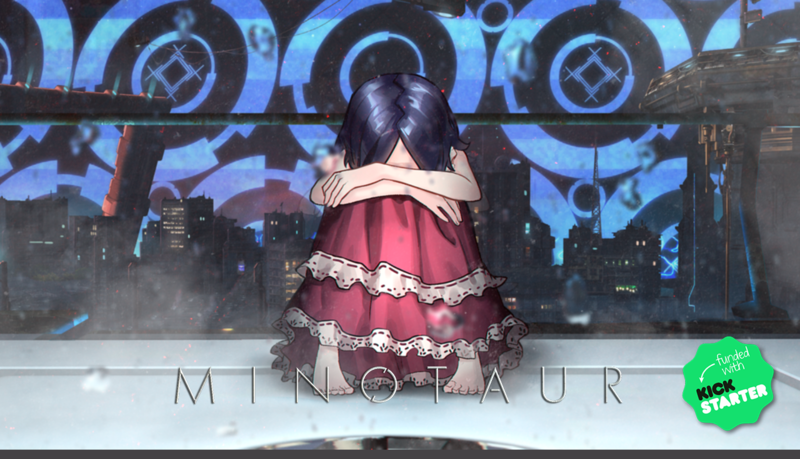 Hearing someone who plays a lot of VNs saying they like Minotaur means a lot! It's really cool that you remembered "The Spirits Within" (we also love that movie! ), and that you took note of extras and even "About" section. We're happy that you liked the animations, and kudos on figuring out the puzzle! We hope you'll play next demos and full version once it comes out. Best of luck with your channel!